Pterocomma populeum apterae are yellowish grey or brownish with paired dark patches on at least the posterior abdominal tergites (see first picture below). There are intersegmental cross-bands of greyish white wax. The second antennal segment has 4-6 hairs (cf. Pterocomma tremulae which has 8-12 hairs on that segment). Pterocomma populeum siphunculi are pale yellow and almost cylindrical with hardly any swelling. The body length is 2.7-4.5 mm. Pterocomma populeum alates have broad dark dorsal abdominal bands (see second picture above). The pictures below are micrographs of wet mounts of an aptera and an alate of Pterocomma populeum in alcohol. The poplar bark aphid feeds on branches, or two year old twigs, of many poplar (Populus) species. Oviparae and alate males may be found in October to November. 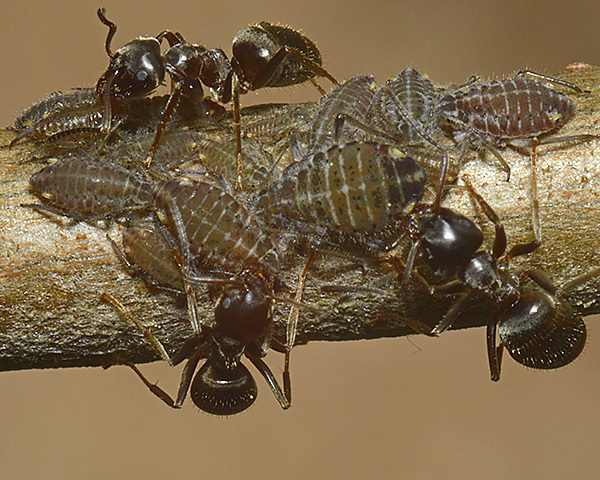 The species is nearly always ant attended. It is widespread in Europe and has been recorded from North Africa and parts of Asia. Pterocomma populeum has been introduced to North and South America. Straw & Tubby (2006) summarized the available information on Pterocomma populeum biology. The first generation appears on the branches and stems in spring as the trees are flushing. These produce another generation of apterae, followed by a series of generations of mostly winged viviparae. In late spring & early summer large colonies can develop on branches and the main stem of the tree. 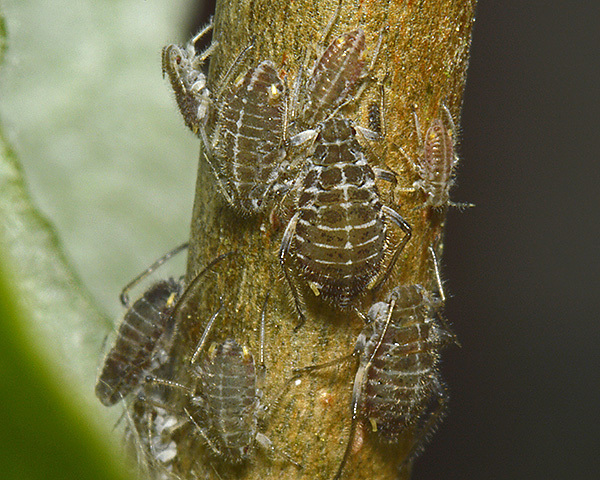 Later in summer the aphids disperse and become scattered in smaller colonies on side shoots and in bark crevices. Winged males and apterous oviparae appear from late September to November, and eggs are laid often in the narrow space between the bud and the shoot stem. We have not come across Pterocomma populeum very often, probably because East Sussex has a distinct shortage of accessible poplar trees to examine for aphids! The only time we have found this species was on young trees in an estate. 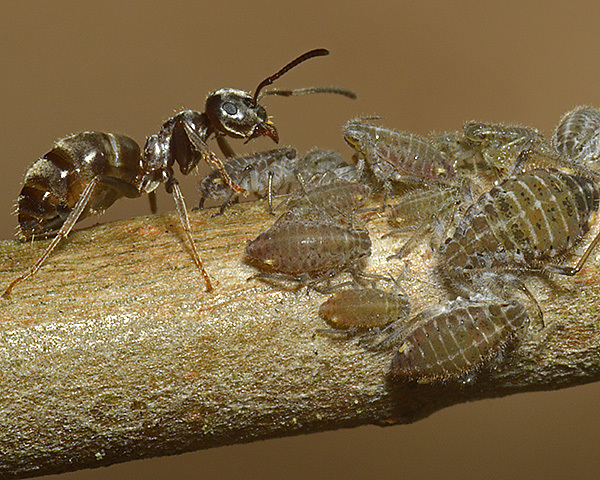 The Pterocomma populeum colony we found was attended by Lasius ants. 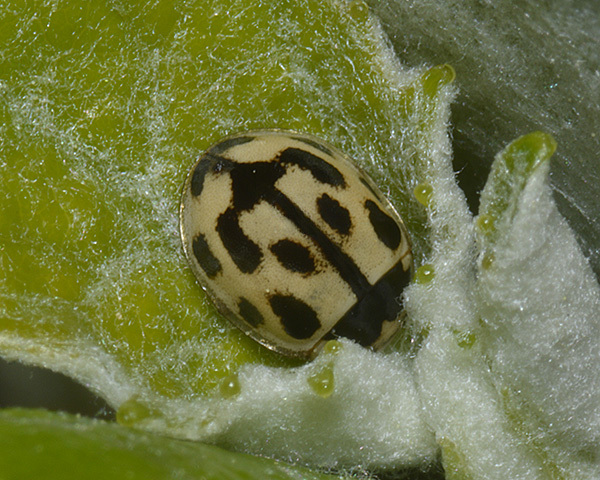 We did observe several 14-spot Ladybirds (Propylea quattuordecimpunctata) searching the leaves for prey, but saw no evidence of them moving to the branches and predating these Pterocomma. 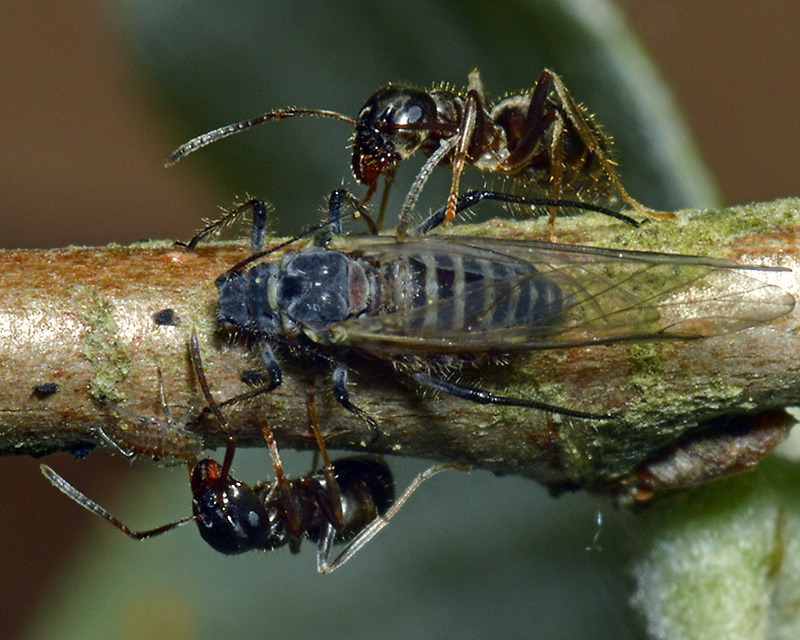 The presence of attending ants probably explains the absence of predators and parasitoids attacking the colony (see opposite situation below). Straw & Tubby (2006) reported a relatively low incidence of parasitism in May, but higher incidence by July when the wasps emerge. 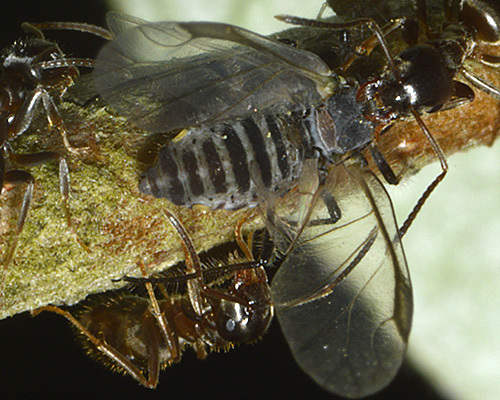 mummies could be found on all the trees with aphids. 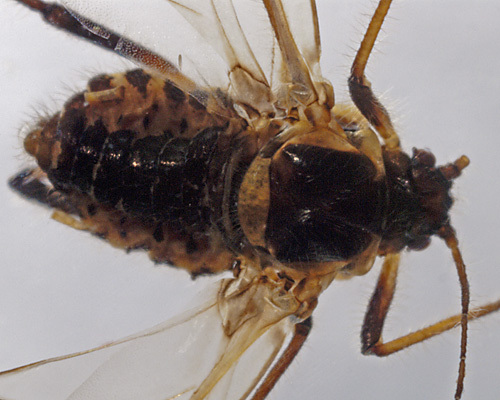 All the parasitoids reared from the mummies belonged to one species, Euaphidius cingulatus, a well known parasitoid of Pterocomma species. Pterocomma populeum has been recorded from 19 Populus species. Blackman & Eastop list about 120 species of aphids as feeding on poplars worldwide, and provides formal identification keys for aphids on Populus (poplar and aspen). Of the 40 aphid species Blackman & Eastop list as feeding on black, or Lombardy poplar (Populus nigra) Baker (2015) lists 17 as occurring in Britain: Aulacorthum solani, Chaitophorus leucomelas, Chaitophorus populeti, Chaitophorus populialbae, Pemphigus bursarius, Pemphigus gairi, Pemphigus phenax, Pemphigus populi, Pemphigus populinigrae, Pemphigus protospirae, Phloeomyzus passerinii, Pterocomma populeum, Pterocomma tremulae, Stomaphis longirostris, Thecabius affinis, Thecabius lysimachiae, and Tuberolachnus salignus. 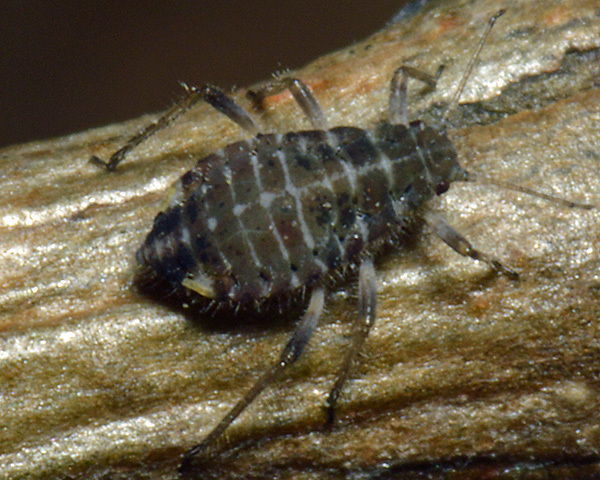 Of the 13 aphid species Blackman & Eastop list as feeding on grey poplar (Populus canescens) Baker (2015) lists 11 as occurring in Britain: Chaitophorus leucomelas, Chaitophorus populeti, Chaitophorus populialbae, Chaitophorus tremulae, Pachypappa tremulae, Pachypappa vesicalis, Pachypappa warshavensis, Pachpappella lactea, Pemphigus bursarius, Pterocomma populeum, and Pterocomma rufipes. Of the 17 aphid species Blackman & Eastop list as feeding on European aspen (Populus tremula) Baker (2015) lists 11 as occurring in Britain: Chaitophorus leucomelas, Chaitophorus populeti, Chaitophorus populialbae, Chaitophorus tremulae, Gootiella tremulae, Pachypappa tremulae, Pachpappella lactea, Phloeomyzus passerinii, Pterocomma populeum, Pterocomma tremulae, and Stomaphis longirostris. Pterocomma populeum is most frequent on young poplars in nurseries and plantations. Under dense colonies the bark of shoots becomes pitted and sunken and eventually dies. Complete girdling of the stem leads to dieback and death of the terminal shoot. Straw & Tubby (2006) studied a severe infestation of Pterocomma populeum associated with dieback and mortality of 2-year old poplars on a farm in north Cornwall. The aphid populations were monitored over two years. Numbers increased rapidly in May but in June declined rapidly. This decline was associated with increasing incidence of parasitism by Euaphidius cingulatus, which Rakhshani et al. (2007) considered a parasitoid specific to several Pterocomma species. Predators were also thought to be active. Aphid numbers did not increase again in autumn, and by the following year the infestation had largely died out. Tree mortality and dieback were largely restricted to the second season after planting, and mainly affected two varieties of Populus x euramericana. Total losses were 7% of the total trees, although factors other than the Pterocomma infestation were partly responsible for the poor performance of infested trees. 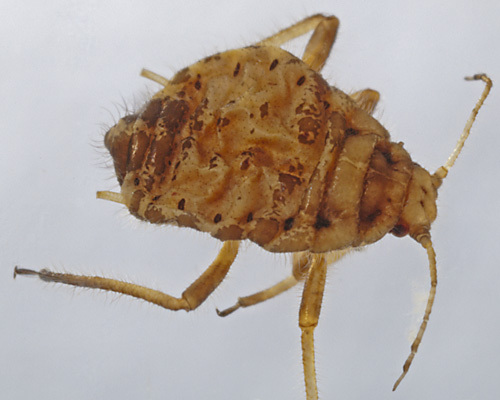 Controlling this aphid infestation with insecticides was not a option as insecticides used to control aphids in agricultural or horticultural crops are not approved in forestry and woodland plantations in the UK. It is unlikely that insecticide application would have improved the situation, since the most badly affected trees were apparently those performing least well because of soil factors. As it was, parasitism and aging of the trees appeared to eliminate the infestation. Straw, N.A. & Tubby, I. (2006). Tree mortality associated with the aphid Pterocomma populeum Kalt. in a young poplar plantation. Quarterly Journal of Forestry 100(3), 43-52.